Dieser Schneemann von Sassy Cheryl hat mich direkt überzeugt… so verträumt kann ich den Schneeflocken auch zusehen! I just had to have this snowman from Sassy Cheryl: I must look just like that once the snowflakes start falling! Die Karte kommt nicht groß daher – aber doch mit einer deutlich Portion Glitter. Ich gebe sie in die Challenge bei Holly Jolly und 52CCT, bei der ersten geht es momentan um Schneemänner, bei der zweiten kann man es sich aus früheren Challenges aussuchen. Und nun genießt euren Feierabend! I kept the card really simply – but with lots of glitter. I enter it at the challenges of Holly Jolly and 52CCT. The former is about snowmen and the latter is „pick a previous theme“ – and „snowman“ was available 🙂 And now enjoy your evening! Oh this is fabulous!! Love the colouring too! 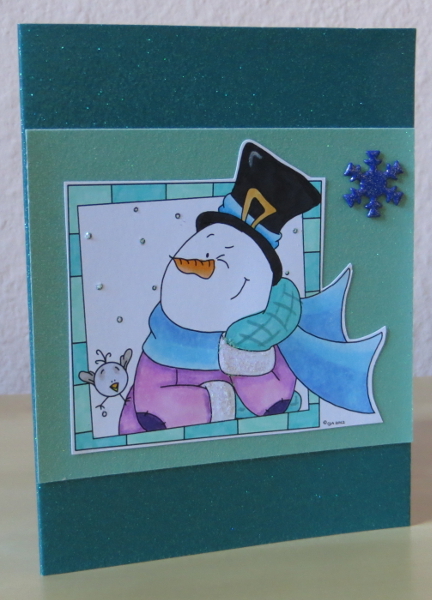 Love your very jolly snowman! Thanks so much for playing along with our Pick a Previous Theme at 52CCT this week!